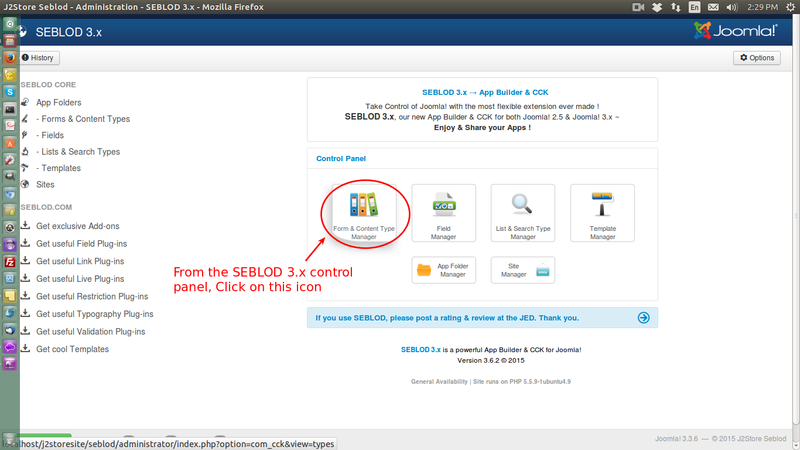 The plugin integrates Seblod content construction kit with J2Store, thus adding ecommerce capability to Seblod. 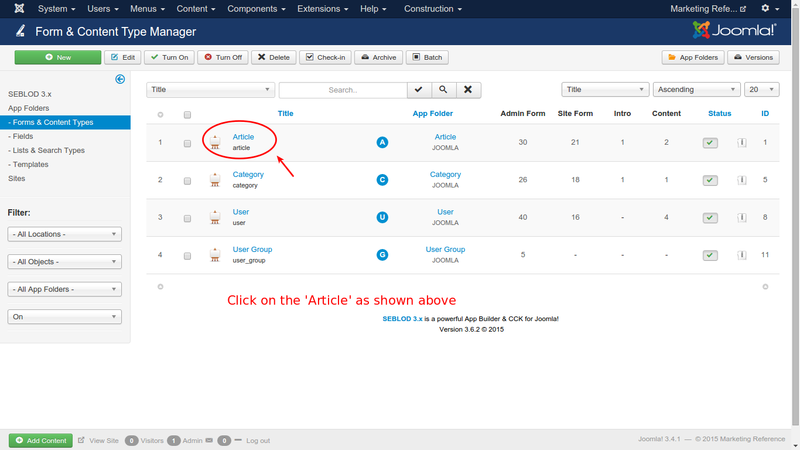 Use the Joomla Extension manager to install the plugin. 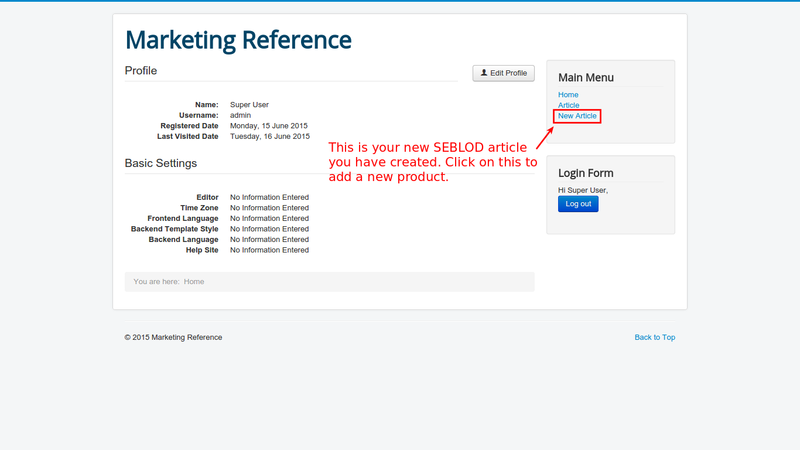 In this section, you will see how to create a SEBLOD article in the backend and frontend. 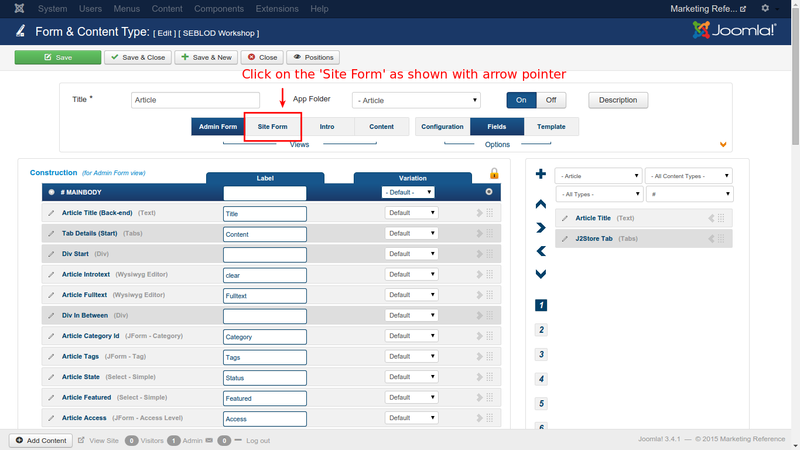 Click on the icon Forms & Content Type. 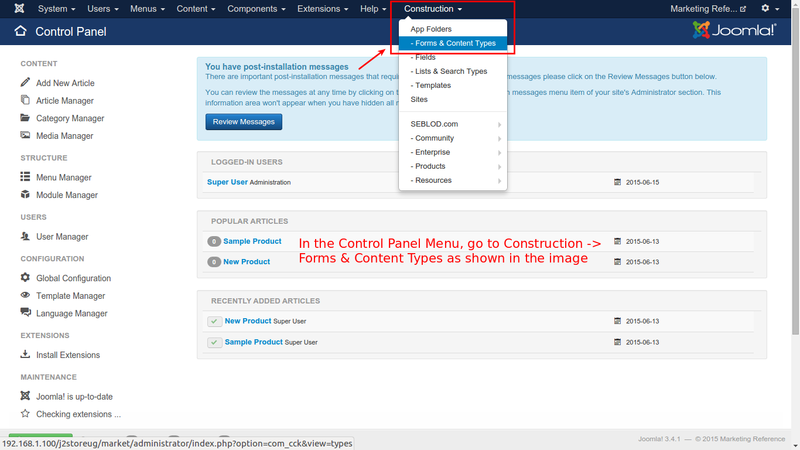 Click on the admin menu link Construction then Forms & Content Types. 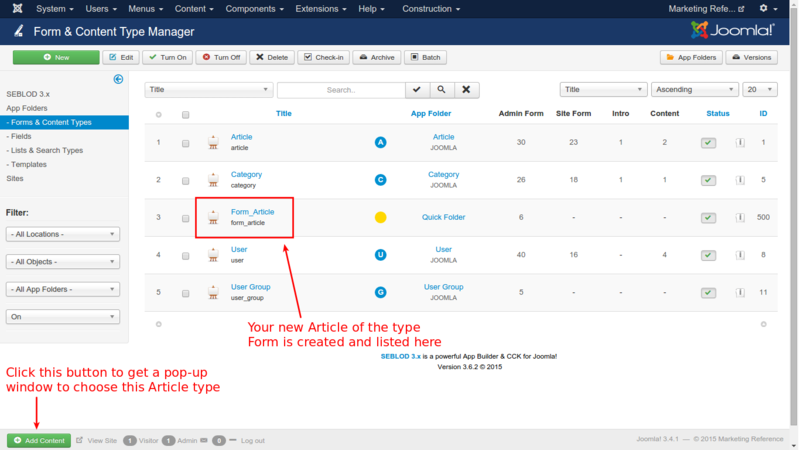 In the Form & Content Type Manager, you should click on the item Article. 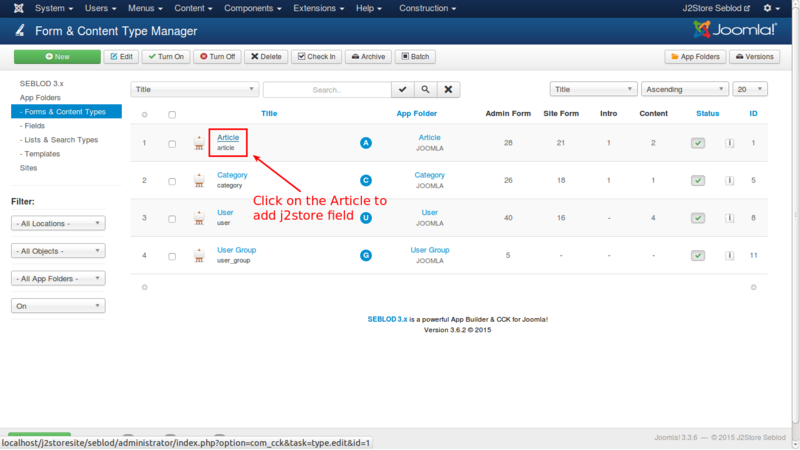 Now we have to add j2store custom field to the Article content type, click on the "+" (button is placed at the right of the Contruction block). 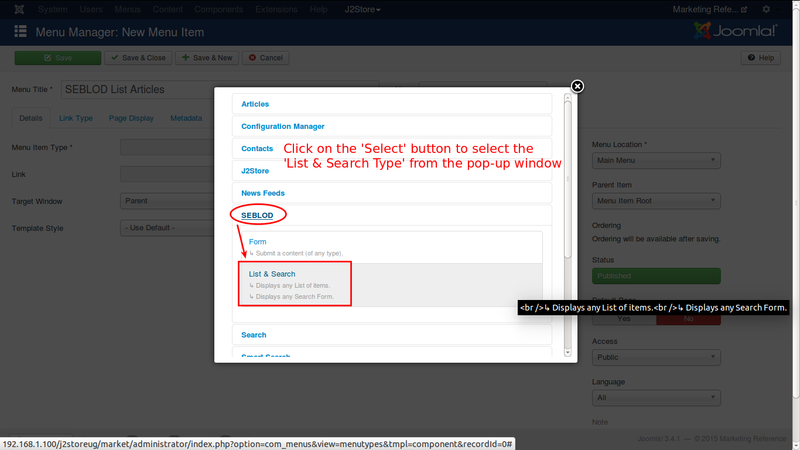 A Form in window popup appears. 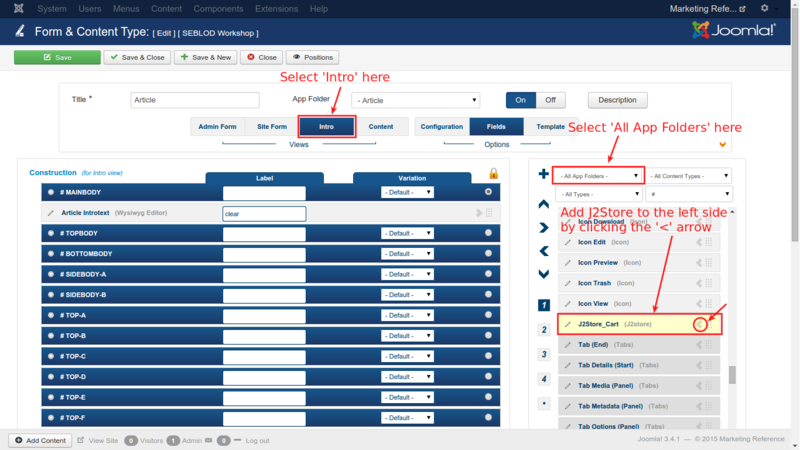 Choose App Folder Quick Folder: then choose type J2store field. Save the changes. 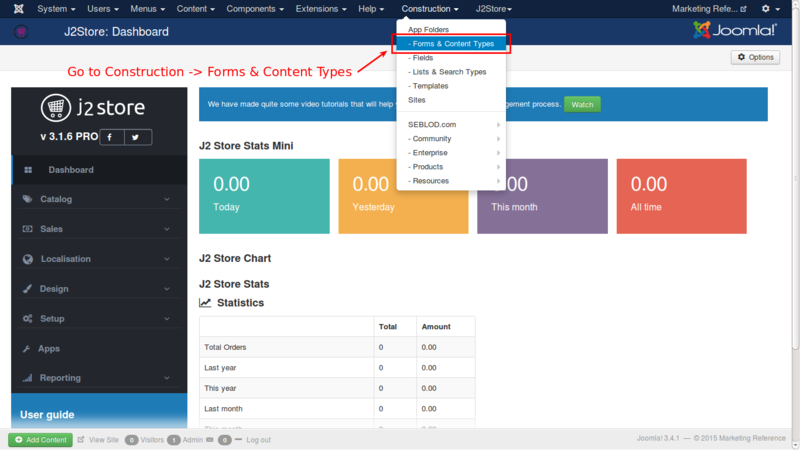 Now J2store field will appear under the Fulltext field (at the bottom of your form on the first tab). 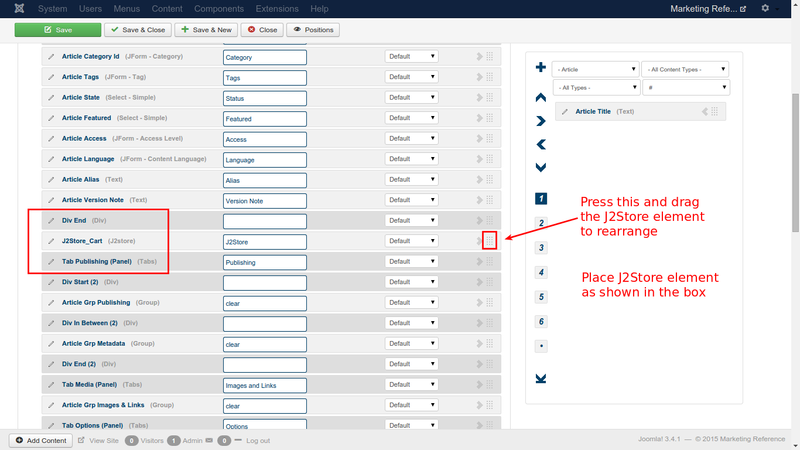 By clicking on the rounded icon, you can confirm the tab panel details and close it. 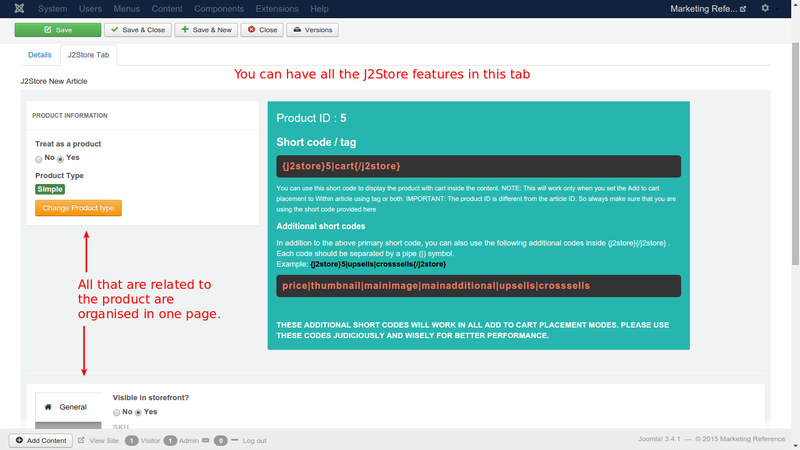 Now you can Configure your product, Set Yes for Visible in store to view at frontend. 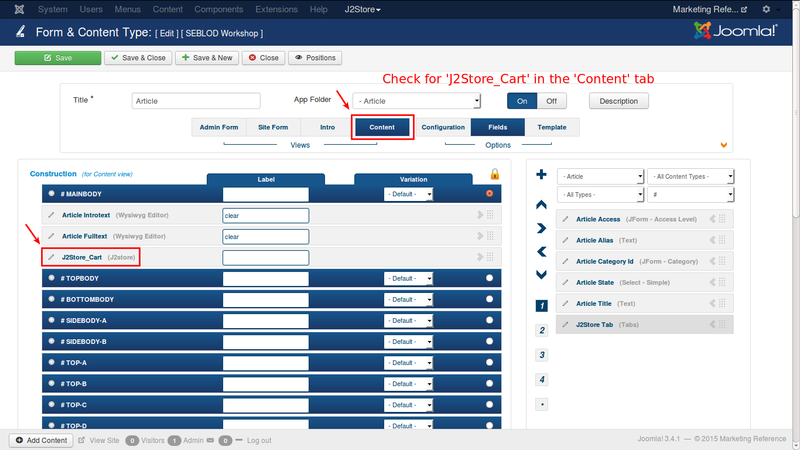 In the right hand side, click on the '<' symbol, next to the J2Store Tab and it will be added to the form as shown in the below image. 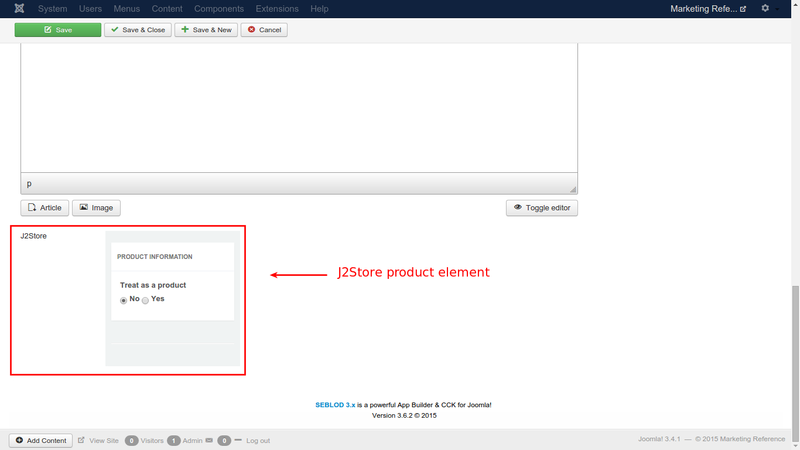 Place the J2Store Tab and J2Store_Cart items in the positions, as depicted in the image by drag and drop. 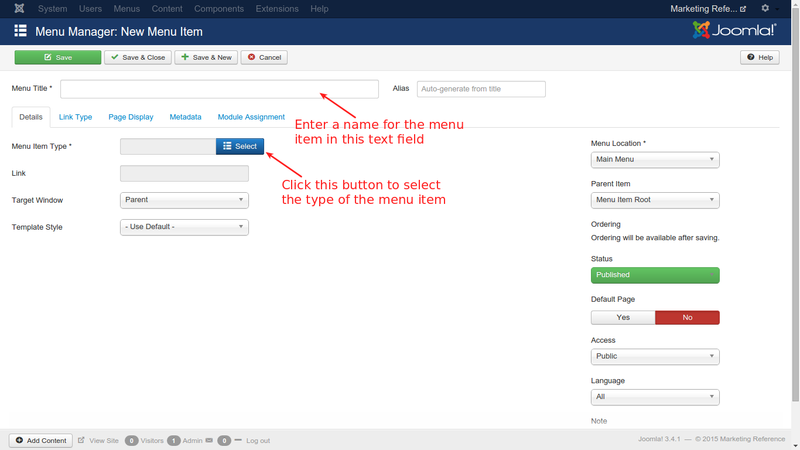 b.Choose the Menu Item type SEBLOD -> choose Forms. 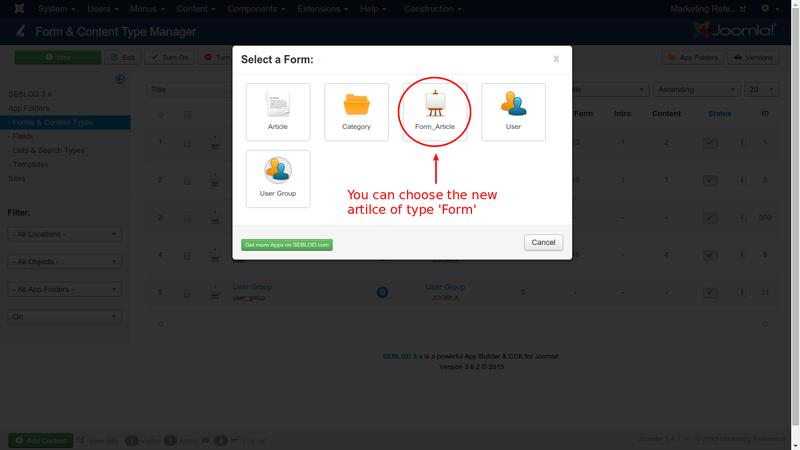 c.From Content Type (Form) input, select Article from the List. 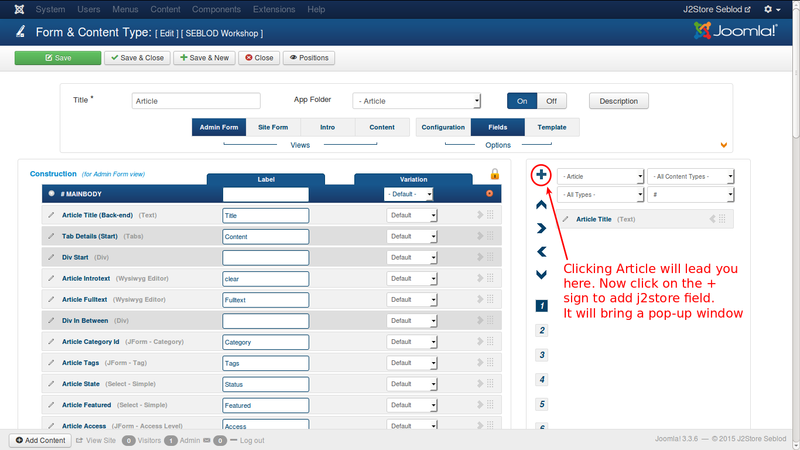 I. Click on the Add Content as shown in the following image. 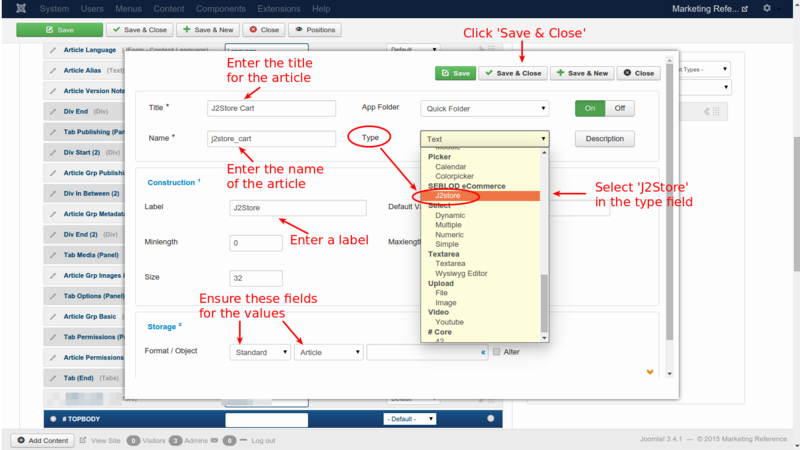 But before you add an article in this type, you need to do edit the article you have created further. Open it for editing. 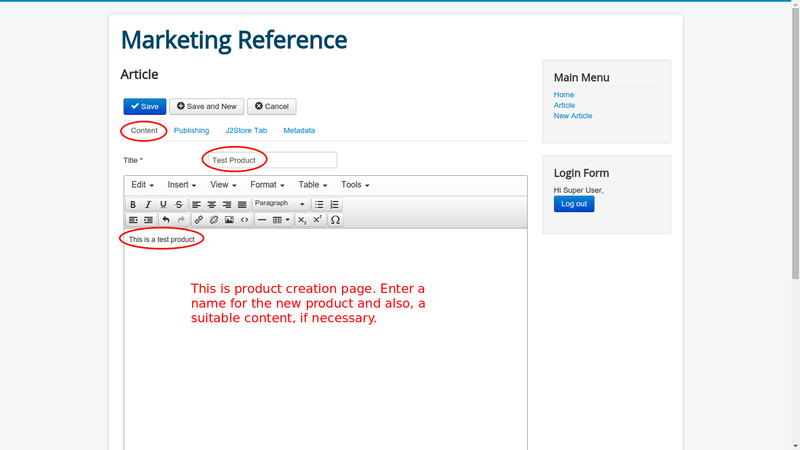 As shown in the image, click on the New Article and you will get the product creation page as shown in the next image. 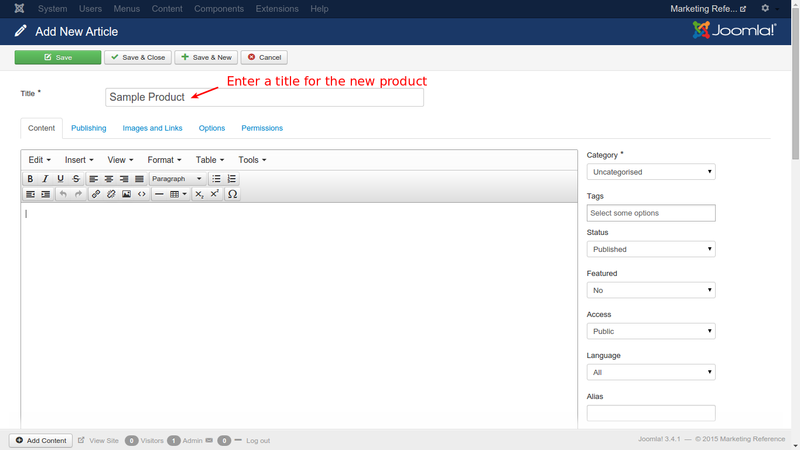 Enter a name for the new product and content for the product. 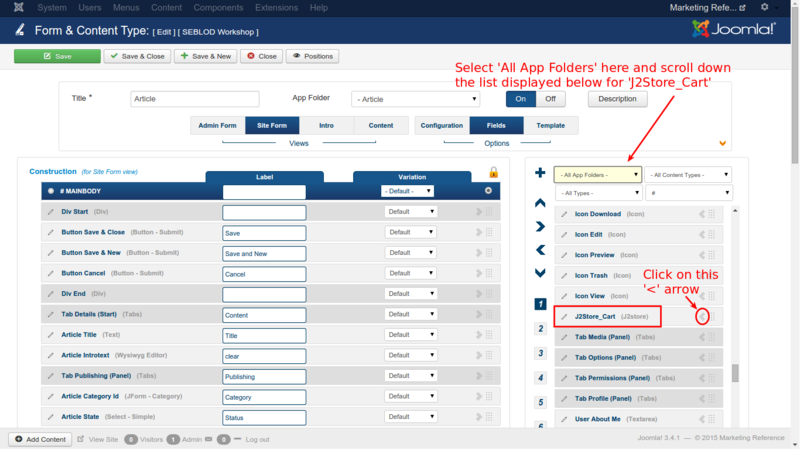 This is Contents tab. 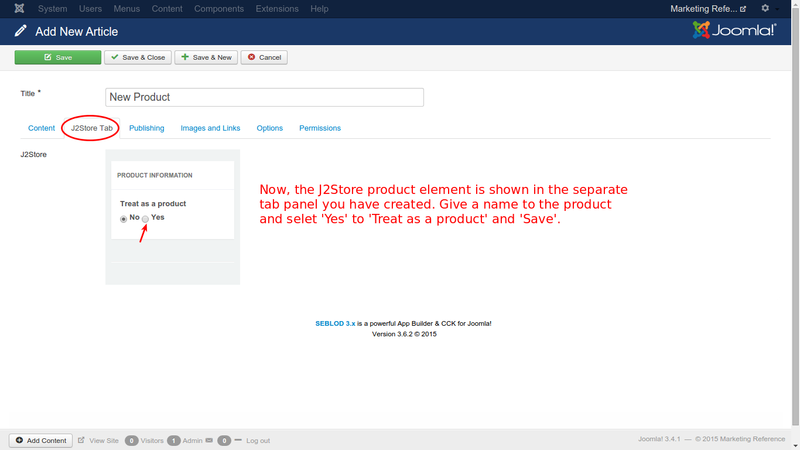 Now, go to J2Store tab. 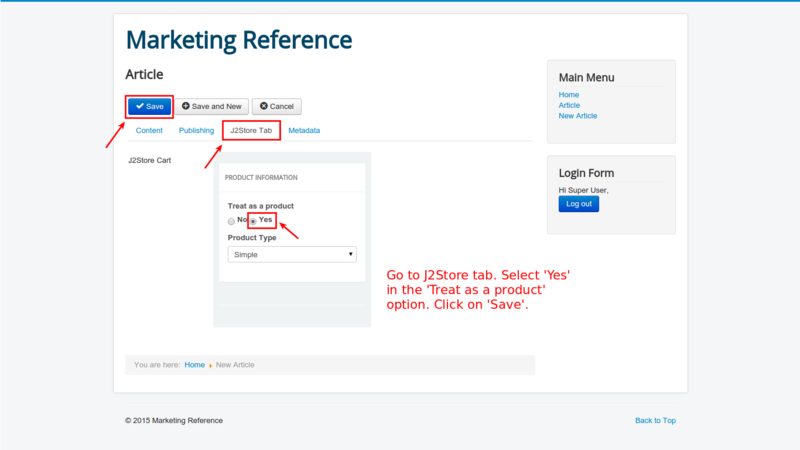 Here, select Yes to Treat as a product option and now click on Save. 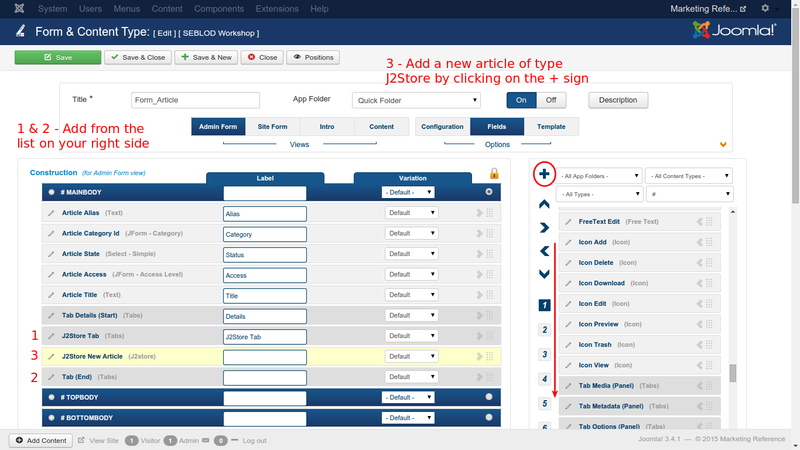 Your product is created and you can configure the product with the product specific details, change the product type, set prices, etc. 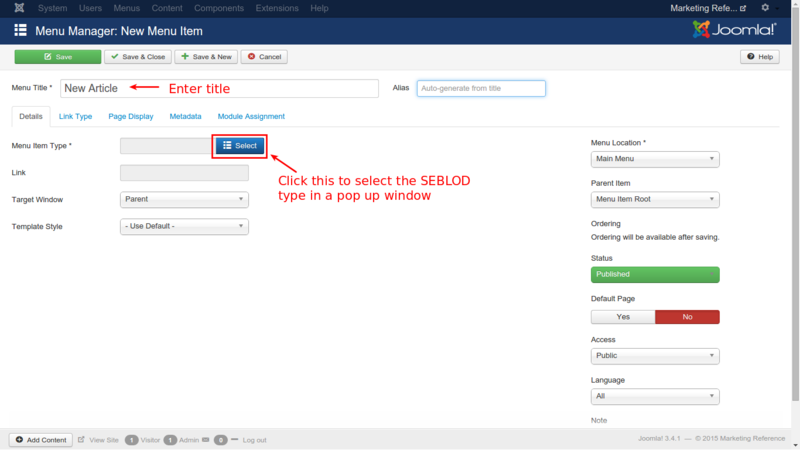 This section will help you understand how to display the SEBLOD article in front end. 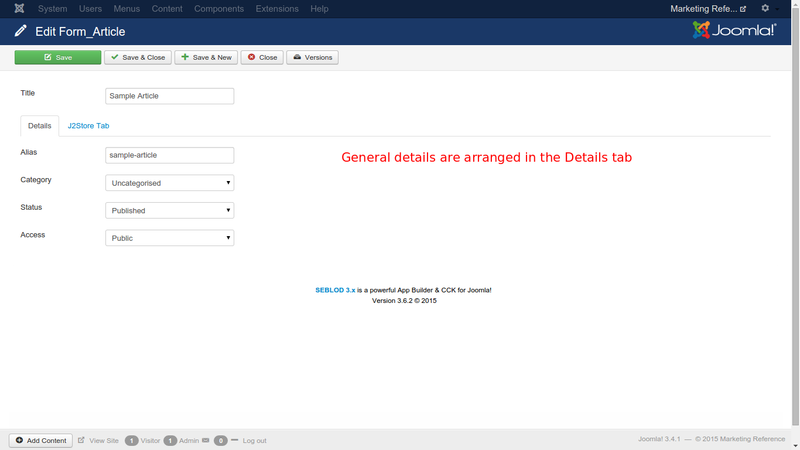 To display SEBLOD articles in the frontend, you need to create a menu exclusively and then you can display it. 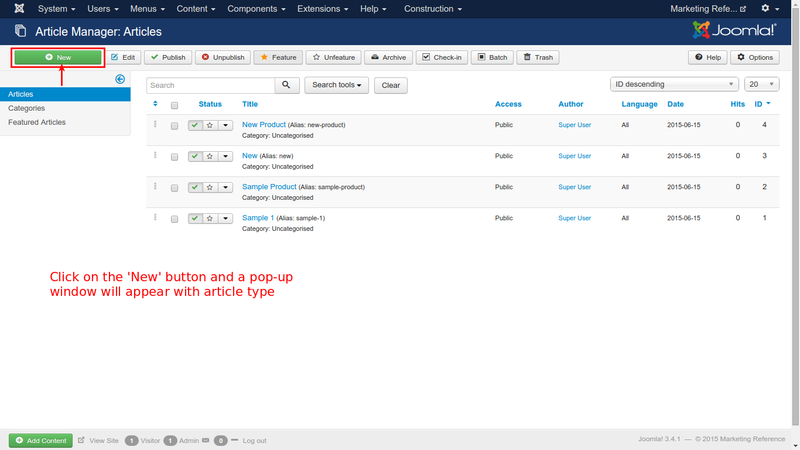 Before you proceed to view the article in frontend, you need to check one thing. 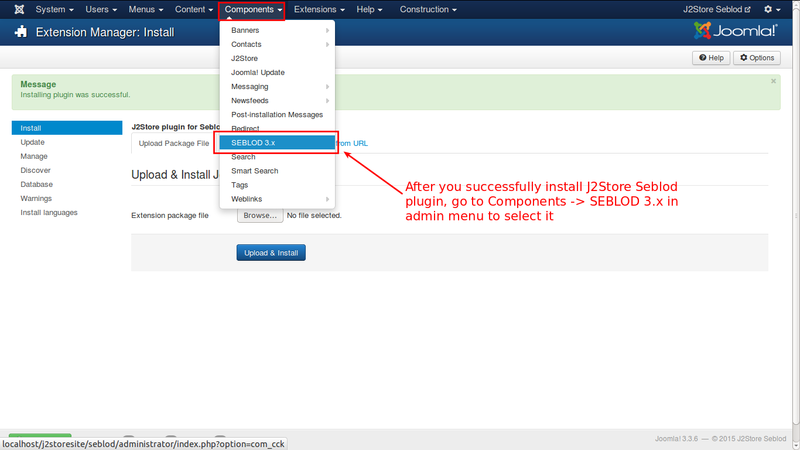 Go to Components -> J2Store -> Setup -> Configuration. 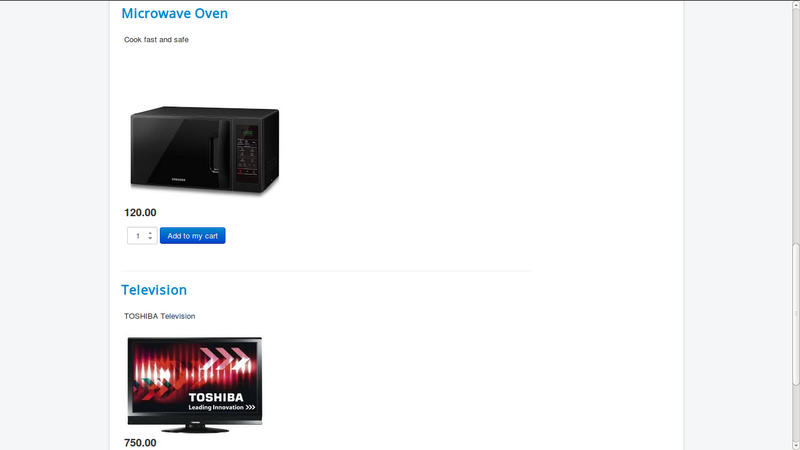 Go to Cart tab. 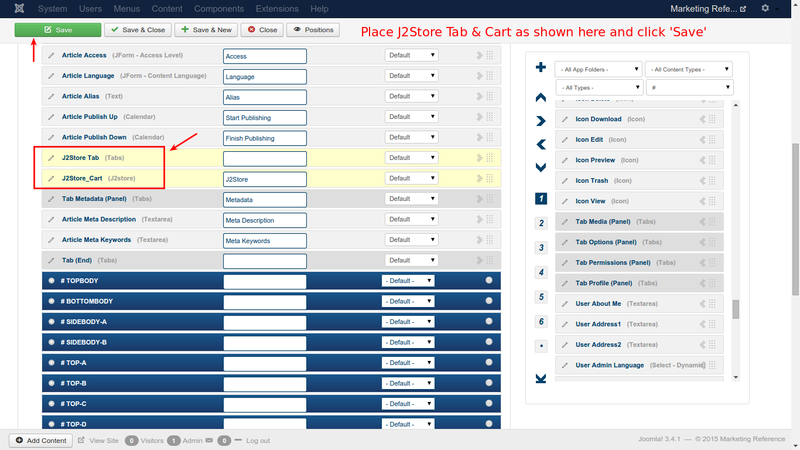 Now, check the setting of Add to cart placement option. 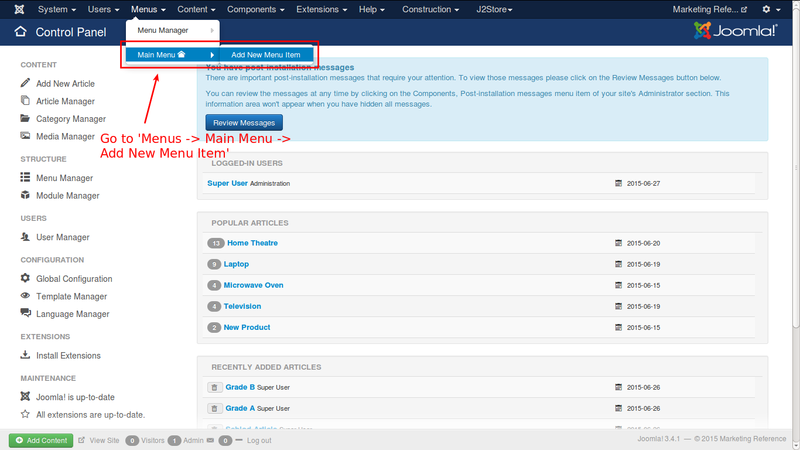 Ensure it is selected with Within article using tag as shown in the image below. 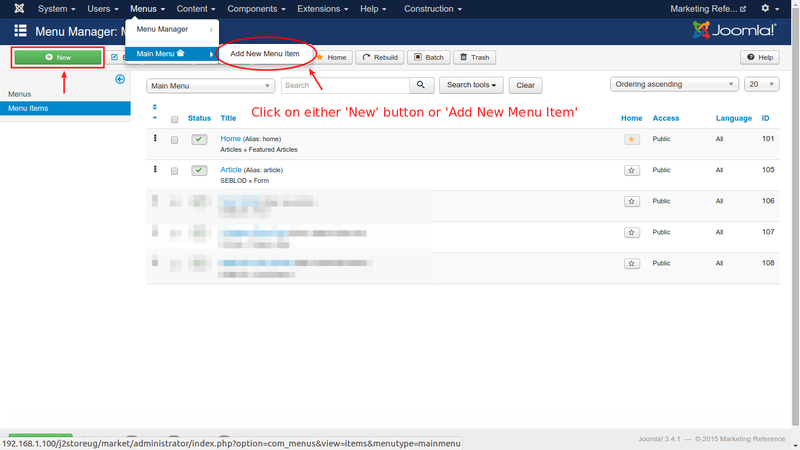 Enter a name for the new menu item and click on the Select button to select the type of the menu item. 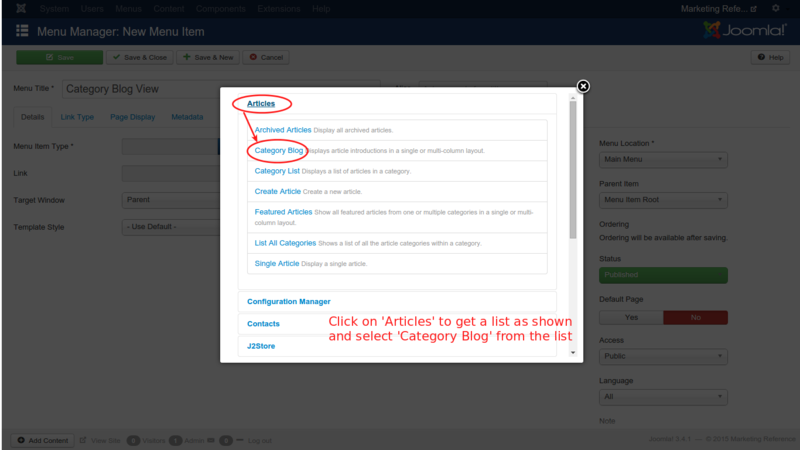 As shown in the image, click on the Articles and you will get a list down the option. 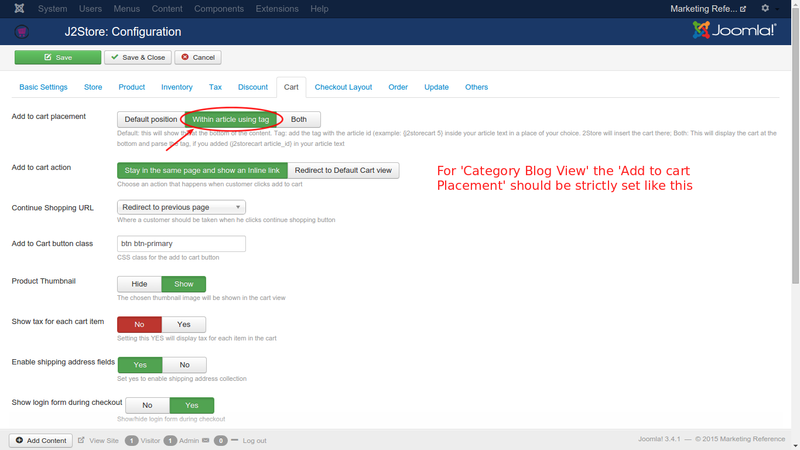 From the new list, select Category Blog. 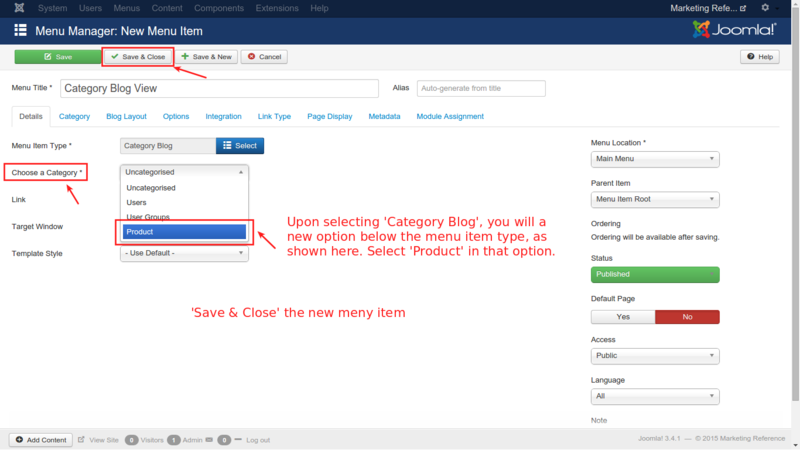 Now, you will get a new option below the menu item type, named Choose a category. 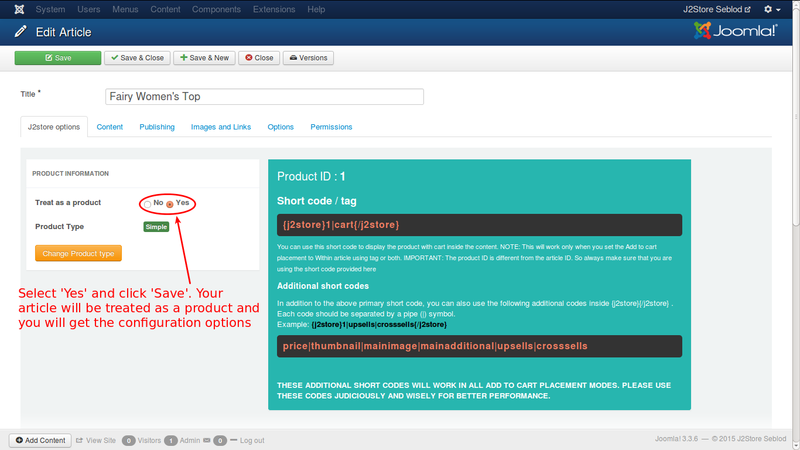 From that option, select Product as illustrated in the next image. 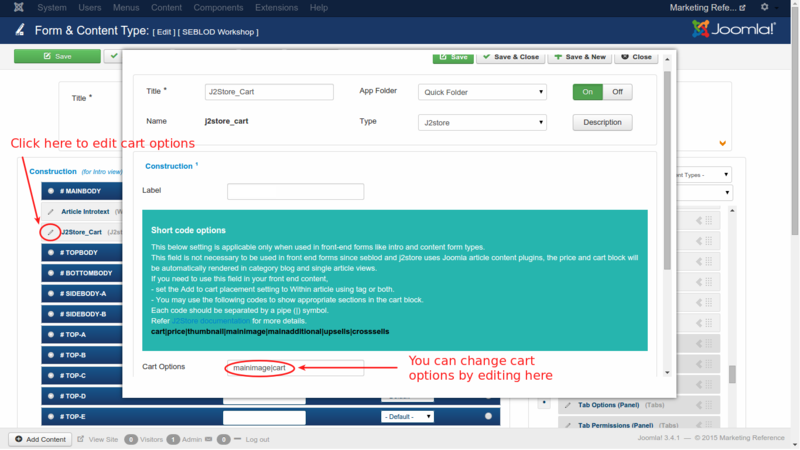 You can edit the cart options by changing the text in the field as per your wish, for time being mainimage|cart. Save the settings. 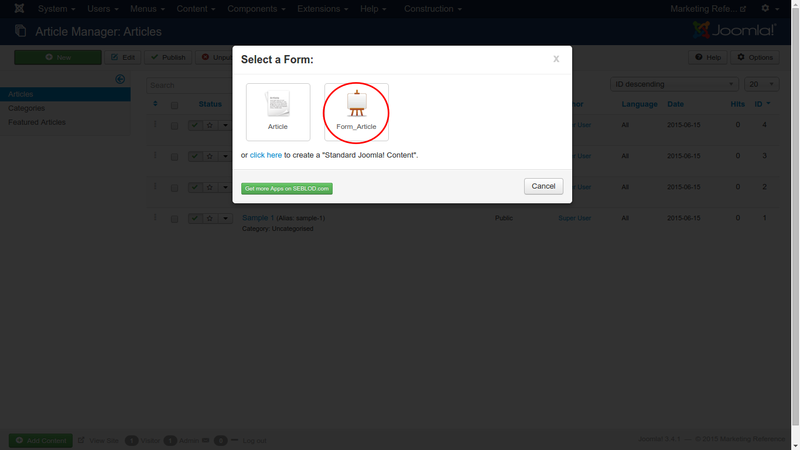 Click on the Article and you will get the settings and configuration of Article. 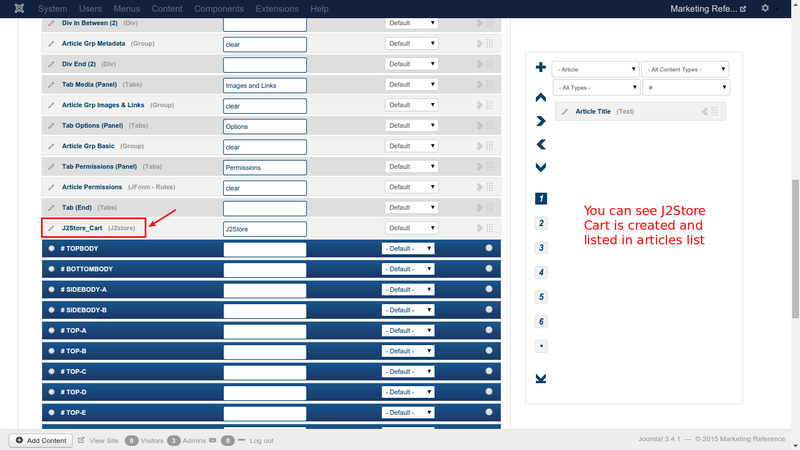 Check for the settings as shown in the next image. 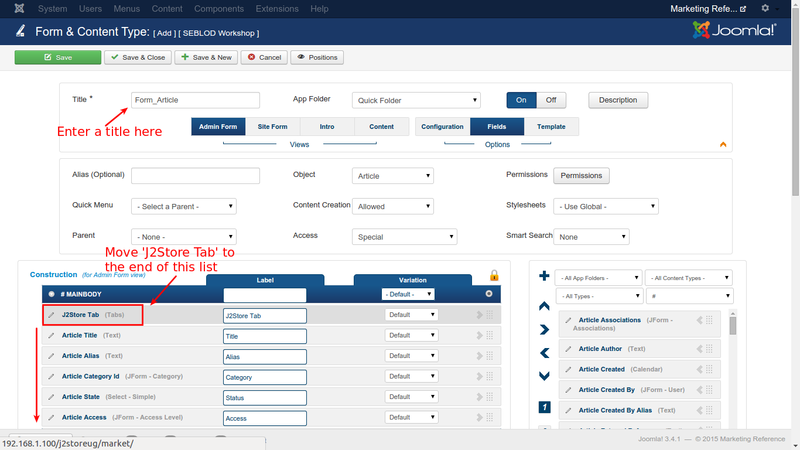 You will get all the articles listed here. 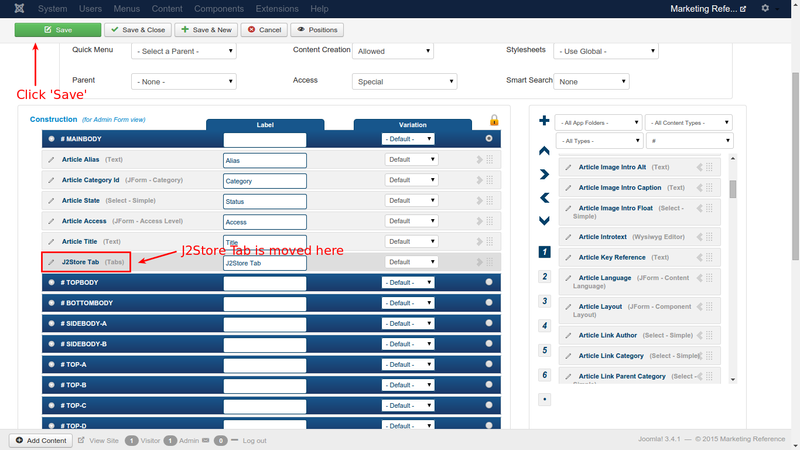 Click on any one article's name, as shown underlined in the image. 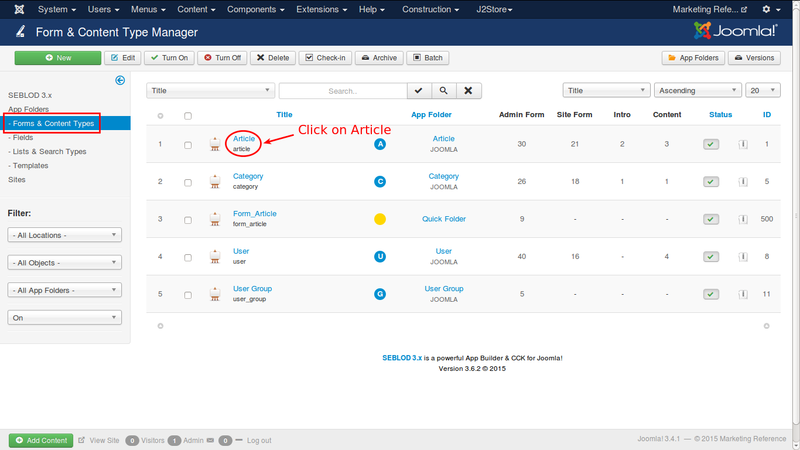 You will get the single article view. 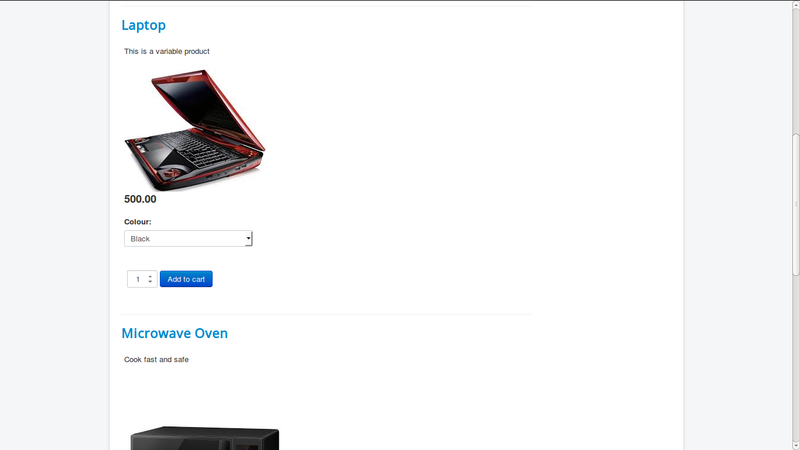 You can see the additional images, the cart, the Next button etc., in the view. 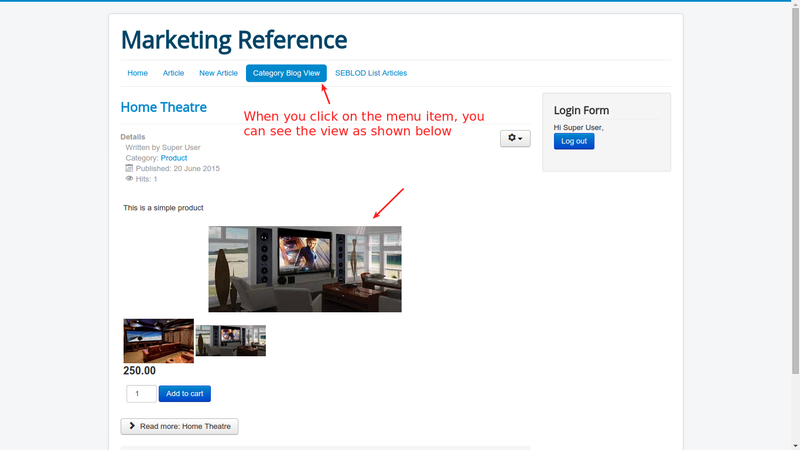 If you hover on the additional images, they will be displayed in the main window, with a zoom effect. 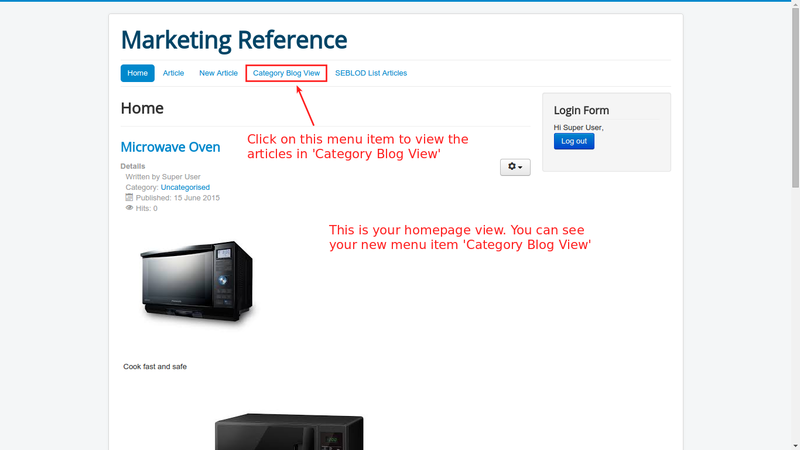 This is how we achieve single article view. In order to acieve the SEBLOD list and search view, you need to create a new menu item of type list and search. The following images illustrate the procedure. 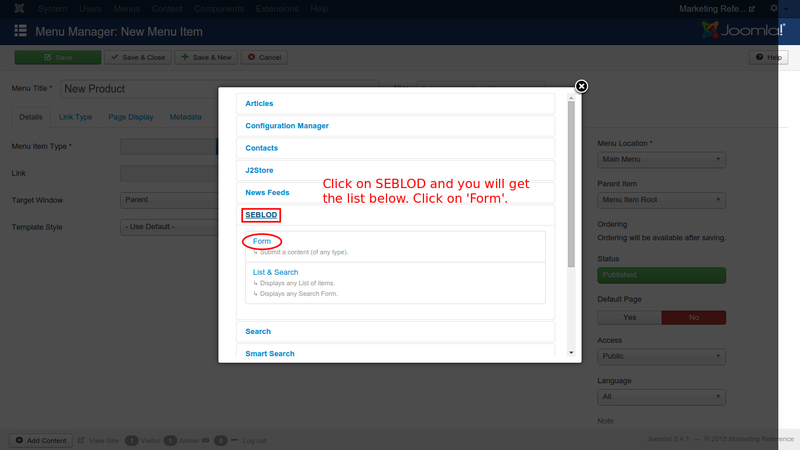 Click on SEBLOD and you will get a list below. 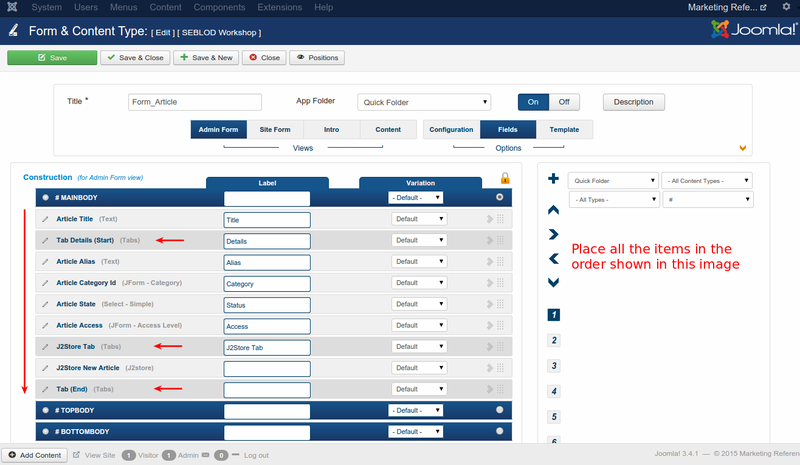 From the list, select List & Search. 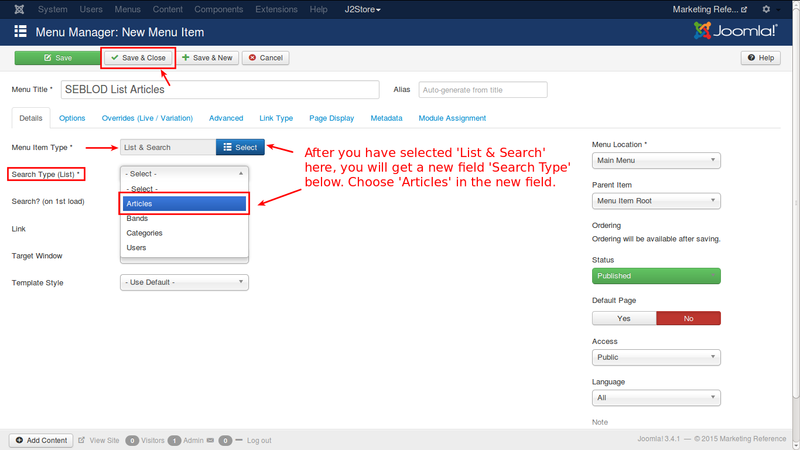 Now you will get a new field below the one you have dealt with just before, as Search Type(List). 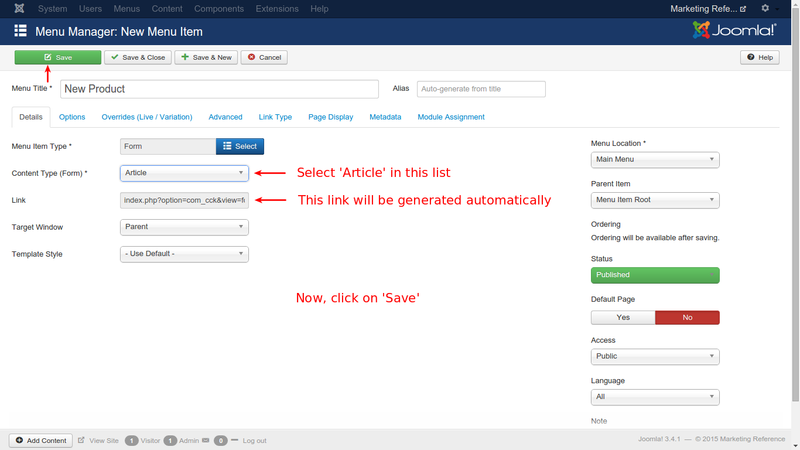 Choose Articles in this field, as shown in the next image. Leave other fields untouched. The Link will be created automatically. Now, Save & Close the menu item. 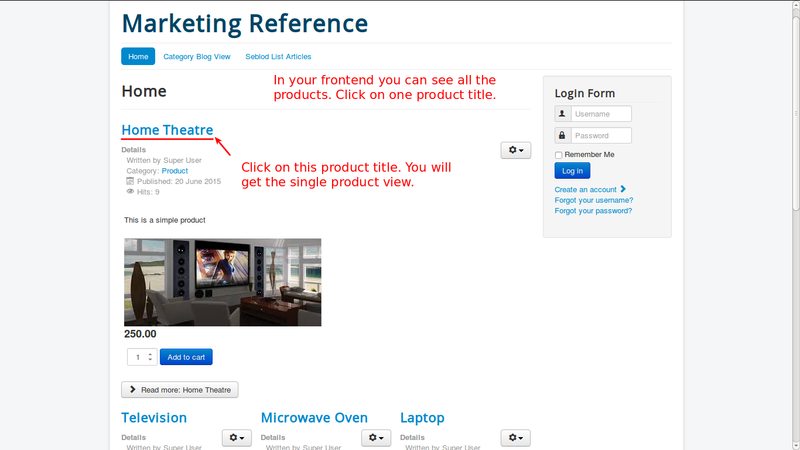 Go to frontend of your site. You can see the menu item SEBLOD List Articles. Click on that and you will get the seblod articles listed down. These are depicted with the help of the following images. 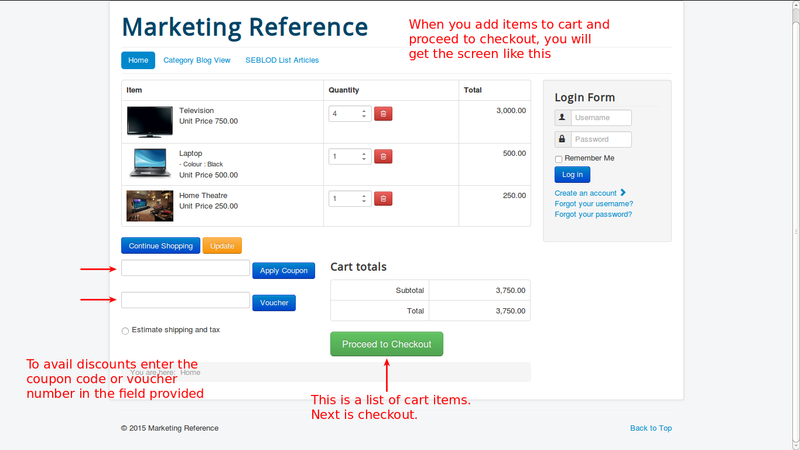 You can checkout with a single click. 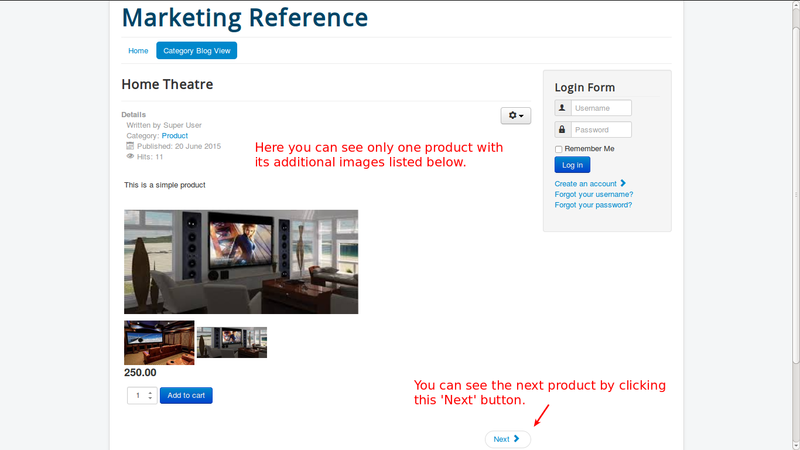 It is not necessary for you to be a registered user. 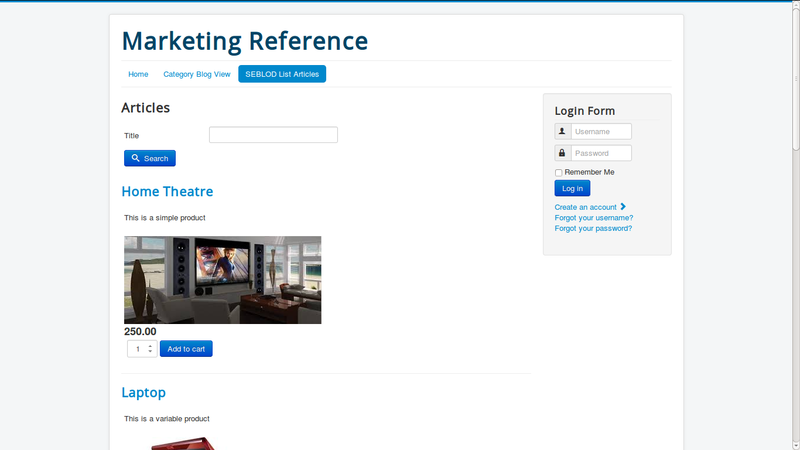 You can checkout as a guest. Later if you want, you can register. 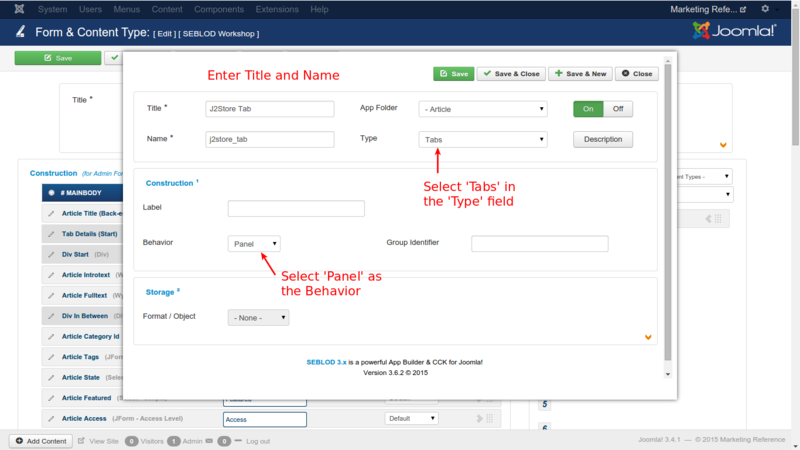 Sometimes you may face trouble in displaying short description and long description (i.e.) 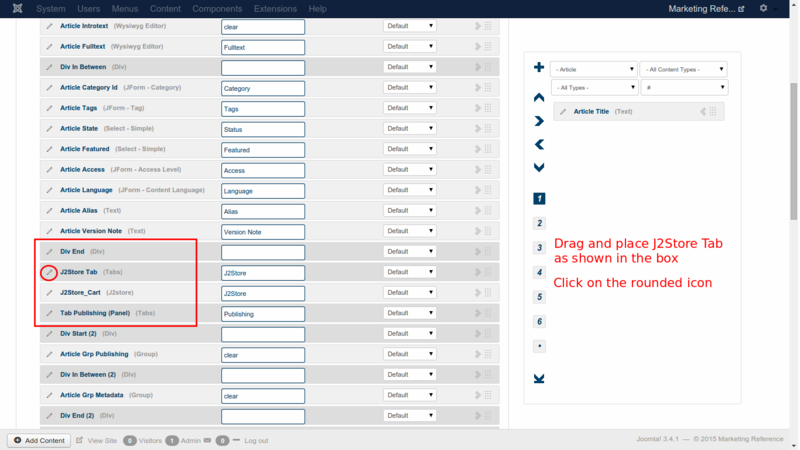 it displays the introtext twice instead of displaying the introtext and the fulltext. If you face above issue, please try below solution which will solve your problem.